From June 2-4th I will in West Bromwich, working on a writing commission as part of Black Country Creative Advantage, curated by Monika Vykoukal. My project builds on a previous contribution to the BCCA seminar that took place in September 2009. For this earlier project – a scripted dialogue written and presented with Pippa Koszerek– I gathered a set of quotations and materials from histories of experimental art practice, exploring their possible connection as method both to urban regeneration issues and Pippa’s own intervention work on this theme. The handout/ reading list for this session is here. For the visit in June, I am interested in exploring more specifically the role of investigative poetics. BCCA have gathered an archive of texts, which are currently on display in the local marketplace (as well as on the project website). A wide range documents and notices create a space that seems a mixture of archive, notice board/ newspaper and project space. I will be spending two days both reading the documents – quite what “reading” involves is one of the issues of the project – and, through conversations with Monika, visitors, and other collaborators, seeing how they function within the project and the stall. I will then produce a piece of writing that both functions as a guide to the stall and works as an autonomous investigative poetics/essaying. Much of the specifics of this will depend on the documents and conversations I have in West Bromwich. But already, in discussion with Monika, I have been thinking about how such a writing could occur, be published and distributed, in such a context. The project, for example, has a number of existent sites, including blog and web site, the market stall, printed newsletter (also available online). Each has both its own possibilities for text, and its own audience. Each will also continue to change and develop as the project continues. 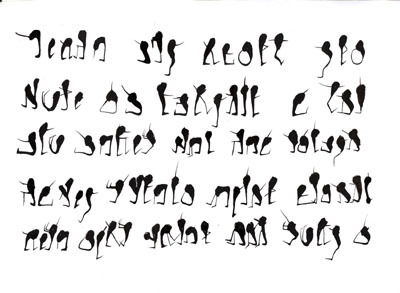 So I have been thinking about some modular form of writing – a set of materials that can be re-arranged for different situations, and also be unfolded (by myself and others) as BCCA continues. Such texts offer a variety of methods for how poets can approach the complexity of places, then represent those texts in written form. Developing the poetics of Charles Olson, the poet-songwriter Ed Sanders, for example, has suggested a model of the poet as an historical scholar, working through all forms of documents, experience, and information, transforming them into “High Energy Verse Grids” or “Data Clusters”. How does public character apply to the project in West Bromwich? To working with an archive of texts? The other set of materials I have been gathering concern practices of appropriation in which the poets work is often less concerned with the generation of new material than with the selection, organising and placing of material in new contexts and constellations, thereby producing new meanings and emphases. a self-appropriation project in which I take statements of facts from some of my cases and re/de contextualize them as conceptual works… I do nothing to the writing except change the font. (TNR to Calibri). It is a Samzidat project, an act of triple-alienation in which I use the product of my paid labor to produce an aesthetic work that removes the case from its subsumptive and utilitarian function as the root or origin of the law. A function that depends in large part on its mimetic fidelity. In this regard, my project is not subsumptive, but creative, not disjunctive, but deterritorialized, not really real but overtly represented. 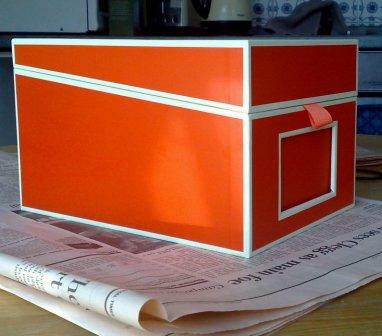 It could work as a book project or function as a visual project. It is an indexical project that betrays or negates the index as it destroys its ethical reason for being, what Kant might consider its categorical imperative. …and, too, Kenneth Goldsmith’s bookwork transcriptions of weather forecasts, traffic reports, and the New York Times as part of a practice of “uncreative writing”, some aspects of which he unfolds in the short essay “Uncreativity as a Creative Practice” here. A similar territory is also explored by Simon Morris and his Sheffield based Information as Material project. Of course, all these projects are embodied in particular practices, moments, histories, and locations. I am not sure how, if, and whether they will apply to the archive material and the broader project in West Bromwich. They certainly highlight one aspect of my project which is to find ways of actively responding to material, working with it, in ways that answer and develop the needs of your own work and those with which you wish to communicate. Welcome to all of you… involuntary ghosts of tomorrow… scoring future imprints down the roads and junctions of unmarked time… welcome to the imperceptible slice between now and now… the progression of idle nanoseconds. Journey with me now and regain a return to where we almost started… journey through the making of each suspended sentence… spectral word… half breathed comma… shifting metropolis… through these unofficial urban arteries of time-ticking creatures… glossed out histories… contrived artefacts… accidental spaces. 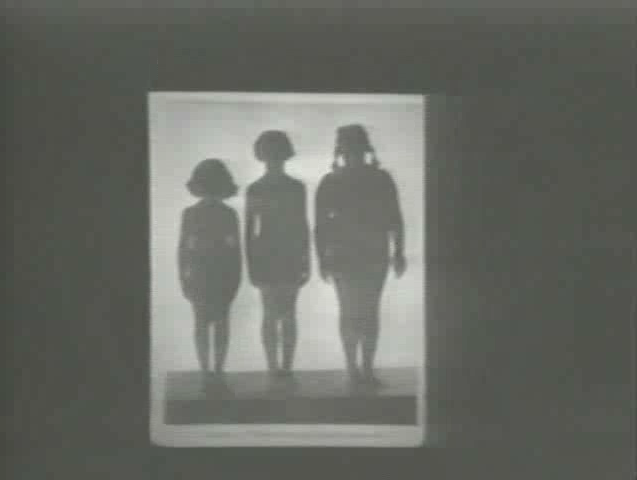 SOME SOURCES: Abigail Child, This is Called Moving: A Critical Poetics of Film (University of Alabama Press, 2005); Brenda Coultas, A Handmade Museum (Coffee House Press, 2003); Geraldine Monk, Noctivagations (West House Books, 2001); Kristin Prevallet, “Investigating the Procedure: Poetry and the Source” in Mark Wallace and Steven Marks ed. Telling it Slant: Avant-Garde Poetics of the 1990s (University of Alabama Press, 2002), 114-129. 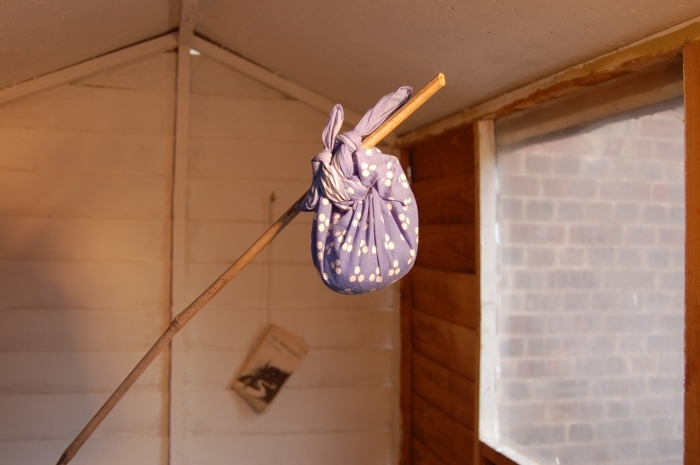 Next week VerySmallKitchen curates The Writer’s House, a three day long series of art writing residencies as part of AWAY DAY, at Wandle Park in Colliers Wood, south London. For information about the full programme of events, see here. The Writer’s House invited five practitioners to devise day long projects that utilised the house/ tent as a studio for a writer in residence, yet also took account of the public and interactive nature of the AWAY DAY event. What happens to the writing when it takes place in the social and natural environments of Wandle Park? What – where – who- when – how- if – then – was/is/will be writing? Projects – by Bram Thomas Arnold, Rachel Lois Clapham (in collaboration with Antje Hildebrandt), Marianne Holm Hansen, Tamarin Norwood and Mary Paterson, each begin as a score (below) with varying relations to what might happen in the park itself. Such scores function as self instruction, an invitation to others, an announcement, a conceit, an observation, hope and warning, attempted seduction, and/or an intuition towards multiple possible activity. 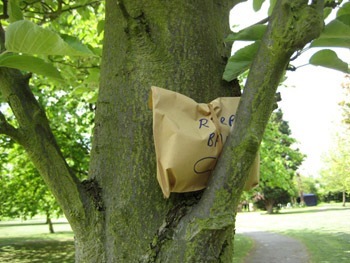 They inhabit the conceptual and physical geographies of Wandle Park via their own. ….an experiment performed as though the landscape were a canvas for the imagination and footsteps were a rhythm for thoughts, language a plane for misinterpretations and translations, mistakes and conversations. We don’t speak much about how we truly feel – so, we will write. For the Record will collate two collaborative lists of words pertaining to the emotions that may occur in relation to the park. The lists will be subsequently filed as documentary evidence of the day . To ensure accuracy, please come along to place your feelings on record. For the Record is an ongoing project by Marianne Holm Hansen. For more information see here. C A N Y O U S E E M E T O O ? 1. Be a person or an animal or an inanimate thing. 2. Sit for a written portrait as you write a portrait of the writer in return. READERS WANTED to share an intimate (w)reading performance for two. This is a little game, a small exercise in trust and a live cursive encounter. You can decide how long it might take. Two minutes is good though. Bring a + 1 with you if you like. Please come. I’ll be waiting. MEMORY EXCHANGE is an experiment, a model for participation, and a document of memory in public and private. 1. Welcome to the Memory Exchange. 2. Please write a memory on a memory card. 3. Submit your memory to the memory archive. This is now the property of MemoryExchange and will be donated to another person. 4. The archivist will give you a new memory. This is now your memory. Remember it. Scores will be performed between 12-6pm on Sat 29th May (Bram Thomas Arnold and Marianne Holm Hansen); Sun 30th May (Tamarin Norwood) and Mon 31st May (Rachel Lois Clapham and Mary Paterson). 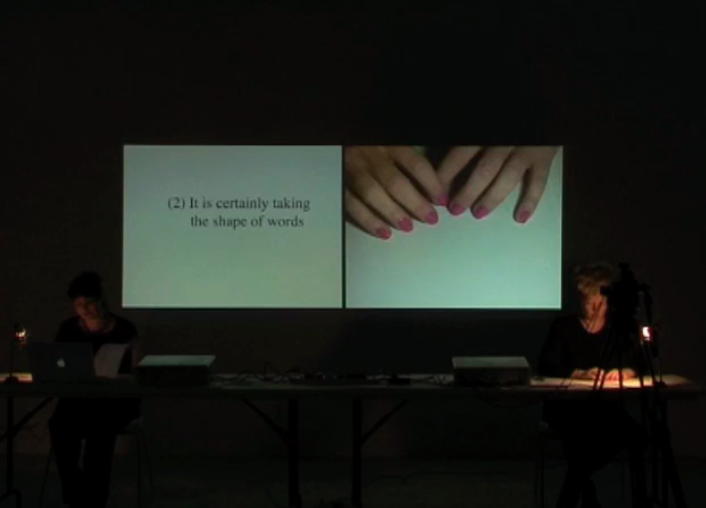 Rachel Lois Clapham and Emma Cocker, Documentation: Stills from the video from the performance reading Re- (2010). NOTES by Rachel Lois Clapham is the second in a series of chapbooks developed by contributers to the ART WRITING FIELD STATION. It is available for online consumption and PDF download here. NOTES began with Rachel Lois’ live-writing performance as part of the ART WRITING FIELD STATION event in Leeds on 27th March 2010. You can read about that performance here. A set of RL’s notes on the project are here. The original instructional score for the performance is here. NOTES, then, as all this NOTES-activity suggests, are not only before, but after and during; final, continual and provisional; eventual and event-full. In the process of coming to NOTES – sporadic (often cursory) reading, collating various bits of online quotes, scraps of articles and materials – I have made copious notes in my usual system. Meanwhile, it has become difficult to delineate which things stem from these starting points; which ideas I encountered in the original texts, and which on various commissions, trips, artworks and conversations with friends. So by way of setting out an ecology for NOTES in the context of ART WRITING FIELD STATION, or delineating a certain ‘field’ for this particular work, I have concerned myself here with what is in these notes on NOTES. The new chapbook NOTES, then, NOTES-distills a sequence of drawing-writings (NOTES) that evoke sense-making towards calligraphic, asemic, documenting, and (glyphic-) exploratory art writing. 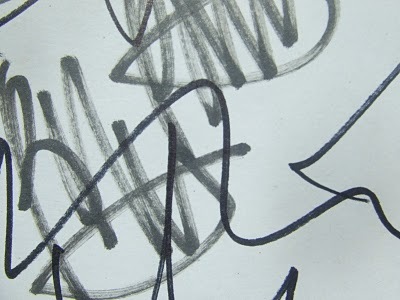 NOTE: As someone who was in Leeds at the ART WRITING FIELD STATION event on Mar 27th these markings still bear traces of the presentations during which they were composed, the (spoken) (written) words they were in proximity to and positioned themselves with/against/towards. Confronted with the new spaces of this PDF publication, such tracings fade as these markings begin to stake out the complexities of new tonal and gestural economies, informed by the demagoguery of The Finger. On Saturday May 1st I was part of a series of readings, performances and screenings, as part of Preambles and Perambulations at The Charles Dickens Musuem in London’s Bloomsbury. The programme began on the museums top floor with Bram Thomas Arnold’s Museum Piece, in which he read a text partly authored by him and partly drawn from introductions to eight Dickens novels. Bram alternated between reading to the room and into a microphone, one of several practical and conceptual ways that his single voice split into something more polyphonic, providing oral edge to the shifting relationship between experience and commentary, 21st and 19th century London, personal and textural, to pose questions of how private experiences became mediated in language and writing/ performance, body and history. Bram’s text seemed to be permitted this eclecticism by its reading persona – both a composed commentator and somewhat edgy flaneur, a city stalked in writing between Iain Sinclair, Stewart Home, Naomi Klein, and Rimbaud, taking “Dickensian” very much as a grime and grim of detail, opening into it a certain aestheticism and romantic melancholy, testing that, what was possible within a commitment to the/a contemporary. A second piece by Bram, performed later in the afternoon, involved reading introductions to Dickens novels into a microphone that echoed/ doubled/ reverberated his voice. This manipulation became telling commentary on the museums construction of Dickens-ness, its own writing genres of wall text and display labels. Readings by Jane Madell and Gary O’Connor were more conventional author readings – Madell a short story published in the Bedford Square 3 anthology of writing from Royal Holloway’s MA in Creative Writing -and O’Connor from his Transition-gallery published novella The Field. In the context of the afternoon, both explored a certain tangential relationship to Dicken’s: a character in Madell’s story is named for Dickens Estella; O’Connor’s thick matter and detail of description unfolded a certain acoustic space of “Dickensian” fiction and narrative. It was also curious to think about how these different fictions were part of different writing careers – one (Madell) very much part of the Creative Writing arena, the later an “art writing” originally part of a gallery installation. I interviewed Gary earlier in the year as part of a response to his northcabin installation – see here – and was interested how book and show related. Saturday’s reading suggested the questions were more ontologic than I had previously thought. Was this important? What differences did it imply? Did it mean different kinds of writing? In the basement there was a screening of Jonathan Trayner’s Past and Present: A Conversation, in which a camera’s slow pan over a sentimental Victorian child portrait was accompanied by a soundtrack of an interview in which a man described the intertwining of his work in a massage parlour with his commitment to communist politics. The interview was read in a way that seemed designed to raise questions about its authenticity,`and how its own detail and constructedness related to that in the painting. I was interested how the slow pan over the painting related to the unfolding of the evidently staged interview, what the rhythm of each meant in terms of discovery and revelation of detail. Sophie Loss’ performance Reading to Myself was in two sections, each of which began in the library of Dickens museum with Loss unfurling an actual size photo of herself, then stepping back and reading to herself. She moved between two books, one am academic study of Dickens reading, the other – I think – a manual on public speaking. Whilst I could see sections in the texts had been underlined by Loss or another studious reader, Loss chose what to read in the moment, flicking through the books to find a passage that articulated a nexus of reader, photo, room, audience, book, and voice. She concluded each part of the reading by rolling up the photograph, almost as a form of punctuation, both prelude and coda. This avoidance of the self was curious to add to the pieces other central paradox: that this a private act of reading in a public place. Loss was also streaming the reading on the internet, suggesting new configurations of public and private in digital space. Loss’ two readings were interspersed by my own piece, THE SOUND OF DICKENS DANCING. This was a text piece whose several starting points included an interest in Dickens practice of the serial novel and reading aloud and a set of manuscripts and drawings written by myself aged six. My piece changed considerably as I worked on it last week after several visits to the museum. How was the museum itself a site for writing, reading and talking? In a work exploring an associative network of ideas – spanning literary history and personal memory – how did the context of the museum limit and define the material that became part of my text and reading? How did personal experience, as well as the moment of reading itself, relate to the constraint based text I had re-written and was, in some ways, re-authoring in moment of the event? Writing the talk has prompted a broader enquiry into the forms of (artists’ – ) talk and lecture, which will be unfolded on this site. The questions were useful to explore in the context of an afternoon characterised by an intertwining of different practices with both the specificity and generality of Dickens, his writings and the museum. Island Projects plan to explore these questions further as part of a larger scale exhibition in the Autumn. 'Y-The Black Issue' Issue, curated by Sonia Dermience, 2010. 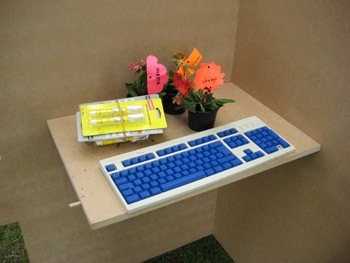 VerySmallKitchen, in collaboration with Short Term Solutions, will hold a public conversation on connections of writing, exhibition and publication, with Sonia Dermience on Friday May 21st 7-9pm. All welcome. The conversation will be a round table facilitated by David Berridge, Karen Di Franco, Marit Muenzberg and Mary Paterson . CURATOR BIO: Sonia Dermience (born 1971, lives in Brussels) founded Komplot in 2002, a curatorial collective concerned with nomadic creative practices, trends of specialisation and the infiltration of spaces. Projects such as ‘Vollevox’ or ‘Architecture of Survival’ explored new terrain in relation to objects, spaces, artists and the public. She has conducted extensive research into post ’68 collaborative art practices in Belgium; organizing seminars and making two documentary films with Kosten Koper. This research is on-going with ‘Marcel’, a collective film and the itinerary exhibition, workshop and publication ‘Y-The Black Issue’. Komplot founded The Public School in Brussels, November 2009, in a joint venture with a residency program at Nadine. This conversation with Sonia is the first in an itinerant series by VerySmallKitchen exploring the relationships of writing, exhibition, and publication. The second will take place in Edinburgh in June at the TOTALKUNST gallery. Email verysmallkitchen@gmail.com for more information. Richard Long, Sixteen Works, Coracle, London, 1984. The following essay, “The Gallery and the Book” by Thomas A Clark, was first published in THE CORACLE: Coracle Press Gallery 1975-1987 (London, 1989) on occasion of an exhibition at the Yale Centre for British Art, New Haven, Connecticut, from 7 Nov 1989 to 14 Jan 1990. It is reprinted here with the intention to insert into contemporary art writing debates and practices its clear working through of relations and questions of art and writing, publication and exhibition, how all parts of that relationship propose and enact forms of (architectural) space, order, and hospitality. It also invites us to conceive of those debates via a working concept of pastoral. Thanks to Thomas A.Clark for permission to reprint. More information about his work can be seen here. For information about CORACLE see here. Often the most subtle and affecting pleasure of an exhibition occurs around and between the exhibited works, in the space the exhibition brings to life. As a glade is something other than the trees but which would not exist without the trees, so the pieces in an exhibition may make a clearing in which they are at last present to themselves, in which relations between works become more evident, in which natural light can come to play. Since the moment when pictures stepped out of their frames and sculptures came down from their plinths, this sylvan idyll has been common and artists have understood that an exhibition should be something more than a gathering of finished works. To compose a living, changing space, a charged context, is part of the strategy of contemporary art. This orchestration of space aims at something extra, an added grace. Yet the result may be so convincing as to seem the very condition of the works, their natural air. In a sympathetic space, a work may suddenly come into focus, with all its details, its tones and overtones, sharp and clear. The movement from one work to another, the dialogue between them, the extent of wall or floor they are able to hold, the light that falls upon them, all these factors begin to be felt as the exhibition takes shape. Where the artist or curator is insensitive to such considerations, the exhibition will remain inert, a number of separate pieces. Where such care is taken, the gallery is made new. The exhibition, in this sense of a bright glade, is not for sale. It exists only for those who can perceive it. It is real but immaterial, comes into being when the works are hung and is dismantled when they are taken down. It may be more lovely than the works themselves. The finite nature of such a space, its lack of commercial motive, the way it often occurs at the farthest reach of the artist’s intentions, is a guarantee of its purity. It may be as fine as a quality of air or as tangible as a challenge. It may be a test for which the artist has long prepared himself or the element in which he moves, a part of his regular practice. Just as we can turn our attention from the particulars of a landscape to breathe the air ,so the visitor can turn aside from individual works to appreciate the surrounding space. Those galleries are best which allow their spaces to be modified in interesting and adventurous ways. Those galleries are best which are capable of such modifications. An exhibition which moves to different venues is seldom successful in the terms I am trying to indicate. It is either too loose, a mere number of pieces, or too tight, a constructed environment to be placed within another environment. A resonant space, which is the result of a sensibility responding to a particular set of circumstances, to a place, is seldom managed with travelling exhibitions. If the gallery is not seen just as a place to present work (or to exploit it) but is respected as a space with its own discretions and possibilities, then the chances of an inventive use of space are more likely. How light enters a room, for instance, its shifts and moods throughout the day can be of constantly changing interest. An exhibition visited at different times of the day, or on different days, can change dramatically in its colours and tensions. The relative size of walls, the sight-lines, corners and alcoves, may suggest solutions in hanging which are specific to particular works. 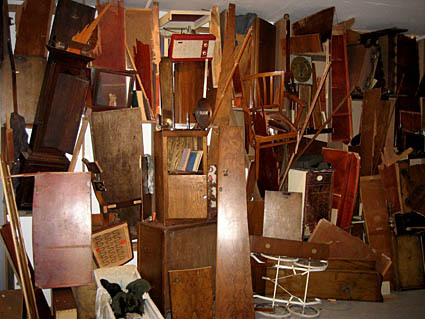 All this can be held and understood within the space created by an exhibition. Another exhibition in the same room will work differently with the given conditions. Although considerations of space are now a commonplace of good artistic practice, I have teased them out here because I believe that perceptions arising from these considerations, or analogous to them, have been carried over valuably into the making of artists’ books. The best book works show an understanding of book form as acute as the artist’s awareness of gallery space. 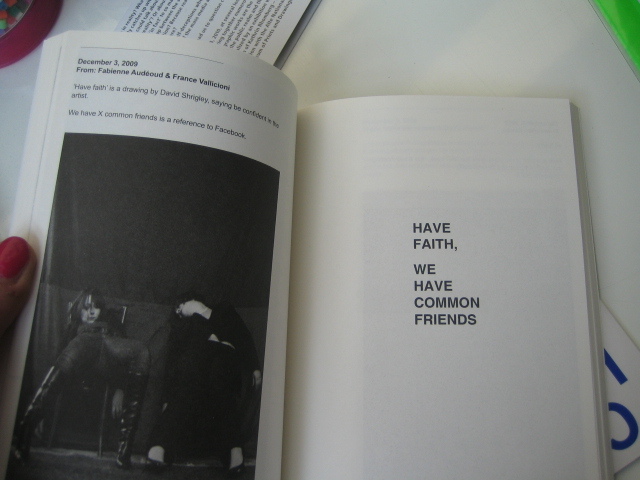 As in ill-conceived exhibitions, the least interesting artists’ books treat the book as a portmanteau for the housing of separately conceived works. Where the form is handled well, the movement within the book and its integrity as an object are as satisfying as felicitous space in a gallery. The first, and in some respects the most incisive, conception of the artists’ book is that it is an exhibition which can be taken away. Where the energised space of an exhibition lasts only for a certain time, where it is unique to a particular gallery, in a book everything stays in place. A book is a permanent exhibition. Its dimensions are specific, its imaginative space boundless. It can be bought for a small sum of money and owned by many people. The aura and prestige of unique works are broken to allow a freedom and idealism more associated with poetry than with fine art. The lightness and flexibility of the form, like the openness of space, tempts the artist closer to the edge of risk. 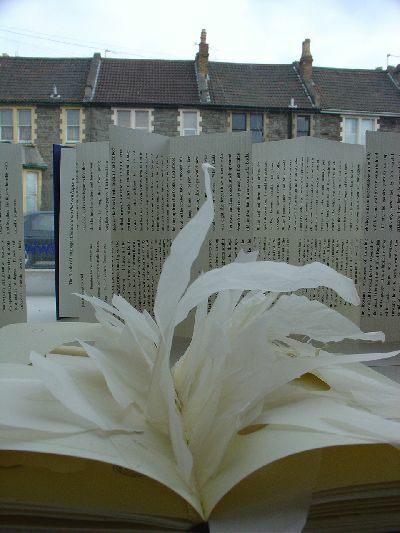 Whatever its size, a book may be give the status within an artist’s work equivalent to an exhibition. It will usually receive the same care and consideration. It is not a minor work, an accessory to the artist’s involvements in more conventional forms. A book may realise aspects of an artist’s work which cannot be adequately contained in a gallery. The major works of some artists may appear in book form and may or may not be translated later to a gallery space. 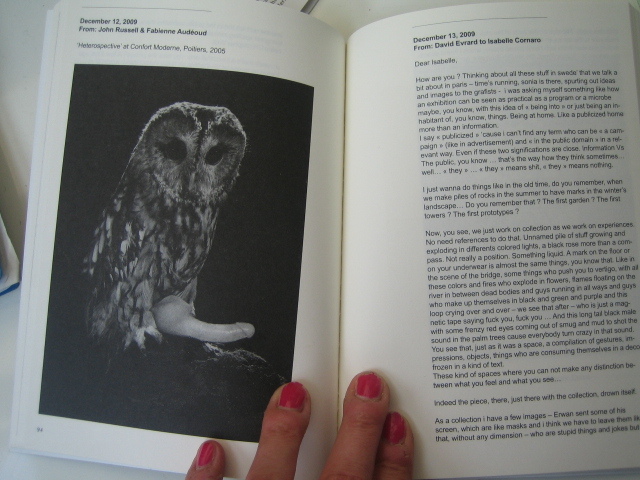 For many artists, the opportunity to make a book is considered no differently from the chance to show in a gallery, each project being worked out according to its possibilities and circumstances. 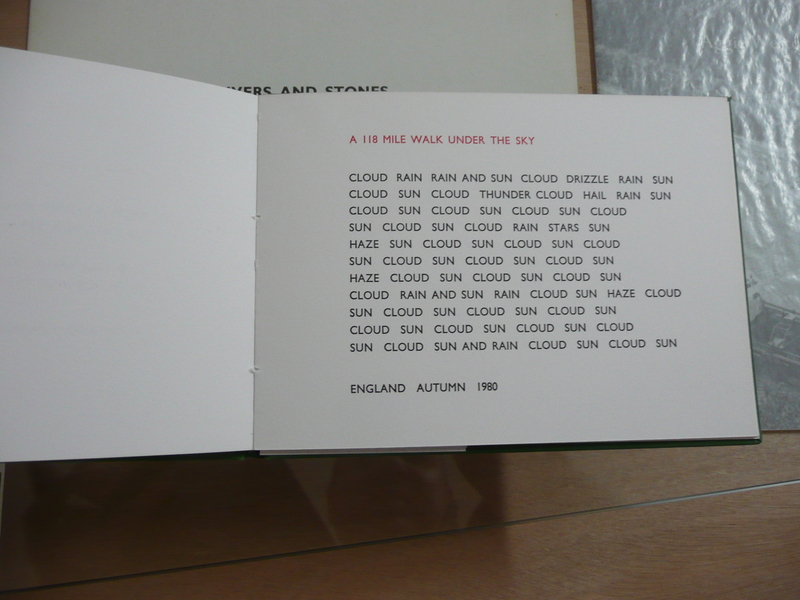 At this point it is, perhaps, necessary to distinguish artists’ books from other publishing ventures. The artists’ book is not a catalogue. It may bear little or no relation to an exhibition. It is a new work and not a record of previous works. Artists’ books are quite definitely distinguished from livre d’artiste. The latter is essentially an aspect of printmaking and bears the same evidence of authenticity as does the original print: edition number, fine paper, expensive price, traces of the artist’s hand. etc. 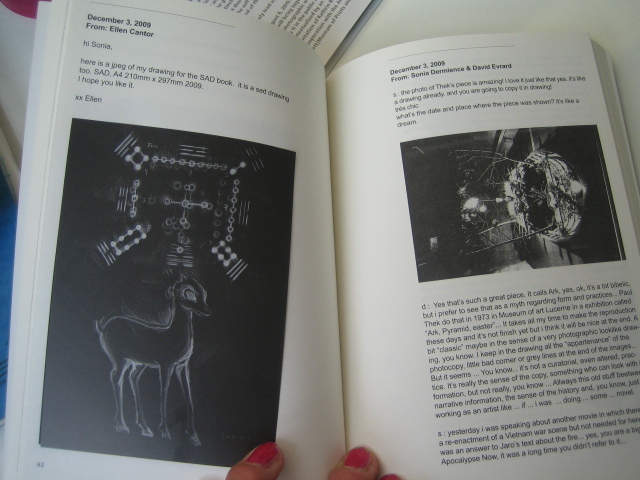 In contrast, the artists’ book is often cheap, mass-produced, and seldom involves the artist in its printing. Where the livre d’artiste exploits notions of rarity, expertise and connoisseurship, the artists’ book usually subverts such notions. Just as an understanding of language nurtures the sense of space, book works are most successful when the conventions of book-making are respected. It is within these conventions that innovations are made and an improvisatory freedom is enjoyed. Good artists’ books look matter-of-fact rather than extraordinary. However beautiful their production, they tend to neatness and control rather than extravagance. Eccentricity is usually precisely that, the departure from a carefully defined centre. It is when the genre becomes invisible that the work is most revealed. As in all post-modernism, there is an awareness and enjoyment of materials and styles but these are worn lightly, treated as natural concerns rather than indulgences. The page, for instance, might be thought of as an area of white wall on which a text or image can be located. 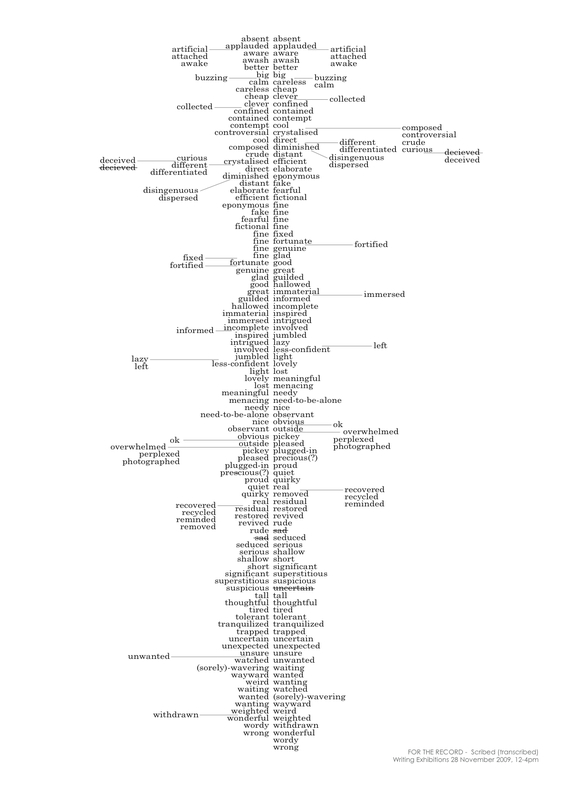 As a picture would most probably be hung at eye-level, so the classical situation for a single word on a page is somewhere just north of centre. Once this is appreciated, any departure is felt as such. It becomes meaningful in its relations to the convention. As pictures hung near the floor or in an asymmetrical arrangement will be read in a particular way, so typography also has its topography. By movement away from the classic proportions, the wall or page is made evident. There are, of course, further conventions which govern the sizes of books, the binding, paper, continuity of pages, etc. These can all be used or avoided in the making of a book work. Reading through Simon Cutts’ “odeon ocean“, we come across the title page in the middle of the book. It is a surprise! Has the book been collated wrongly? What would happen to the order of the pages were we to reassemble the book ourselves? This is, of course, an example, of the sort of humour we expect in Cutts’ poetry, the sort of game that he usually plays with language, although in this case the language is that of book production. The device is made possible by, and draws attention to, the fact that the book consists of a single sewn gathering which has simply been reversed to create this deliberate mistake. It is less of an avant-garde gesture than the risk of someone who is playfully at ease with the conventions. 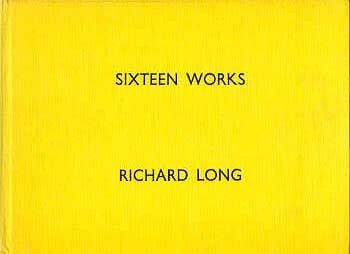 A more pervasive but no less acute sense of the book’s properties and possibilities is shown by Richard Long in books such as Twelve Works and Sixteen Works. The format of these books is characteristically restrained and workmanlike. Text works are set in sans-serif type in black or, occasionally, red ink. Yet, within the austerity there is considerable variety and movement. The ideas and contents of the works vary a great deal and the lay-out of the words on the page is consistently inventive. 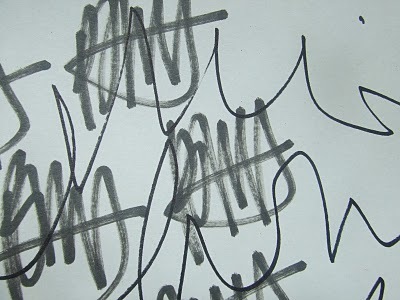 Each work is isolated by the left-hand page being left blank. This gives them an outdoor clarity or the emphasis of works on a gallery wall. All is in accordance with Long’s preference for an impersonal, geometrical art. Long works within the space of a book in exactly the way that he works in a gallery; in an alert, professional manner, the context allowing the work its full power, the clarity of the work ordering the space around it. Richard Long, Twelve Works, Coracle, London, 1981. 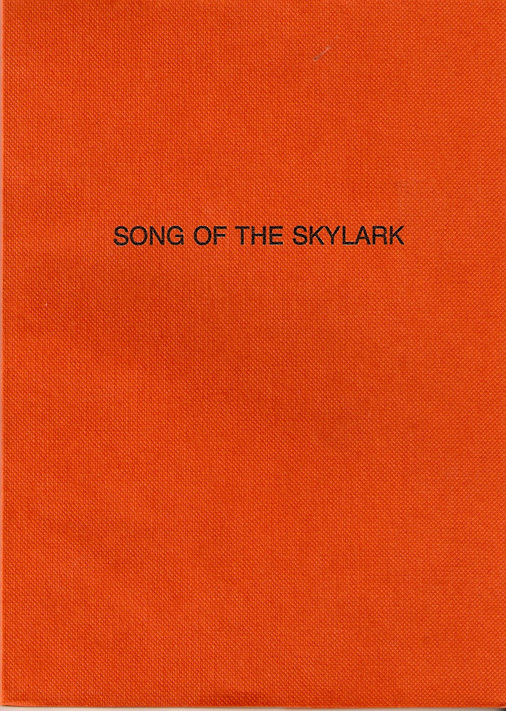 In Hamish Fulton’s Song Of The Skylark, a similar confidence is carried through a single long work. The book consists of a number of texts annotating short walks or runs round Fulton’s home near Canterbury, each walk or run taking up one page and the pages accumulating to make a complex, many-faceted work. As each walk was complete in itself, so each page is self-sufficient but the discipline of running and walking regularly over the same territory provides a rich collection of periodic or intermittent occurrences. To read through the book is to absorb an amount of similar and dissimilar information, the recurring experiences providing a firm structure for Fulton’s lyrical perceptiveness. It seems perfectly natural when a sequence of two-mile runs is interrupted on the seventh day of the seventh month, when he takes just seven pages. There is no need here for the production to draw attention to itself, since the idea of an artist making a book is perfectly assimilated. I have chosen these few examples from books published or produced by Coracle Press because, although their output is varied and often eccentric, they have consistently understood that a complete assimilation of the book form may well result in a modesty of production. They have no so much insisted on the book as an object as allowed it to function as a space. Just as Coracle’s gallery space was informal and welcoming, so they have welcomed the artist into the production process, often to achieve a remarkable balance between the format and the work. More generally, the freshness and idealism, the disinterestedness and tact that we may find applied to the orchestration of space in a gallery, is characteristic of the whole enterprise of artists’ books. I think they come from the same source, an awareness that the creative process is a vocation that extends beyond the production of separate, self-enclosed, unique works.